Chiunque teme davvero per il futuro del paese ha bisogno di un favore a questo punto : il boicottaggio economico. Una contraddizione in termini? Il boicottaggio è il minimo di tutti i mali e potrebbe produrre benefici storici. E ‘il meno violento delle opzioni e il meno suscettibile di provocare spargimento di sangue. Sarebbe doloroso come le altre alternative, ma le altre sarebbero peggio. Partendo dal presupposto che l’attuale status quo non può continuare per sempre, è l’opzione più ragionevole per convincere Israele a cambiare. La sua efficacia è già stata dimostrata. Sempre più israeliani hanno iniziato a preoccuparsi circa la minaccia del boicottaggio. Quando il ministro della Giustizia Tzipi Livni mette in guardia sulla sua diffusione e chiede, di conseguenza, che la situazione di stallo diplomatico sia superata , fornisce la prova della necessità di un boicottaggio.Lei e gli altri stanno unendo il movimento di boicottaggio, disinvestimento e sanzioni. Benvenuta nel club. Il cambiamento non arriverà da dentro. Questo è stato evidente per lungo tempo. Fino a quando gli israeliani non pagheranno un prezzo per l’occupazione o almeno non cominceranno a fare il collegamento tra causa ed effetto, non avranno alcun motivo per decretarne la fine. E perché la classe media residente di Tel Aviv deve essere disturbata da ciò che sta accadendo nelle città della West Bank o nella Striscia di Gaza? Quei luoghi sono lontani e non particolarmente interessanti. Finché l’arroganza e l’auto-vittimizzazione continueranno a sussistere nel popolo eletto, il più scelto al mondo, sempre l’unica vittima, non cambierà niente. Nessuno – scrivente incluso, ovviamente – vuole un altro ciclo di spargimenti di sangue. Una non-violenta sollevazione popolare palestinese è una opzione, ma non è certo che accadrà presto.Gli Stati Uniti non fanno alcuna pressione su Israele e poi c’è l’Europa. Il ministro della Giustizia Livni ha dichiarato che il discorso in Europa è diventata ideologico. Lei sa di che cosa sta parlando. Ha anche detto che il boicottaggio europeo non si sarebbe fermato ai soli prodotti realizzati negli insediamenti in Cisgiordania. La distinzione tra i prodotti della occupazione e i prodotti israeliani è una creazione artificiale. 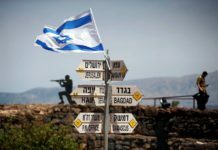 Tutta Israele è immersa nell’occupazione , così tutta Israele deve assumersene la responsabilità e pagare il prezzo per questo. Siamo tutti coloni.Il boicottaggio economico si è dimostrato efficace nel Sud Africa.. La rivolta, la statura carismatica di leader come Nelson Mandela e Frederik de Klerk, il boicottaggio dello sport del Sud Africa e l’isolamento diplomatico del paese hanno contribuito alla caduta di un regime odioso. Ma la fine è stata fissata dalla comunità imprenditoriale. E può accadere anche qui. L’economia israeliana non sarebbe in grado di resistere al boicottaggio. E ‘vero che all’inizio aumenteranno il vittimismo, l’isolazionismo e il nazionalismo, ma non per un lungo periodo. Questo potrebbe causare un cambiamento di atteggiamento.Quando la comunità imprenditoriale comincerà a premere sul governo, il governo dovrà ascoltare e forse anche agire. Quando il danno è nel portafoglio più israeliani si chiederanno , forse per la prima volta, perché tutto ciò sta accadendo. With Israel entering into another round of diplomatic inaction, the call for an economic boycott has become a patriotic requirement. Anyone who really fears for the future of the country needs to be in favor at this point of boycotting it economically. A contradiction in terms? We have considered the alternatives. A boycott is the least of all evils, and it could produce historic benefits. It is the least violent of the options and the one least likely to result in bloodshed. It would be painful like the others, but the others would be worse. On the assumption that the current status quo cannot continue forever, it is the most reasonable option to convince Israel to change. Its effectiveness has already been proven. More and more Israelis have become concerned recently about the threat of the boycott. When Justice Minister Tzipi Livni warns about it spreading and calls as a result for the diplomatic deadlock to be broken, she provides proof of the need for a boycott. She and others are therefore joining the boycott, divestment and sanction movement. Welcome to the club. The change won’t come from within. That has been clear for a long time. As long as Israelis don’t pay a price for the occupation, or at least don’t make the connection between cause and effect, they have no incentive to bring it to an end. And why should the average resident of Tel Aviv be bothered by what is happening in the West Bank city of Jenin or Rafah in the Gaza Strip? Those places are far away and not particularly interesting. As long as the arrogance and self-victimization continue among the Chosen People, the most chosen in the world, always the only victim, the world’s explicit stance won’t change a thing. It’s anti-Semitism, we say. The whole world’s against us and we are not the ones responsible for its attitude toward us. And besides that, despite everything, the English singer Cliff Richard came to perform here. Most Israeli public opinion is divorced from reality − the reality in the territories and abroad. And there are those who are seeing to it that this dangerous disconnect is maintained. Along with the dehumanization and demonization of the Palestinians and the Arabs, people here are too brainwashed with nationalism to come to their senses. Change will only come from the outside. No one − this writer included, of course − wants another cycle of bloodshed. A non-violent popular Palestinian uprising is one option, but it is doubtful that will happen anytime soon. And then there’s American diplomatic pressure and the European economic boycott. But the United States won’t apply pressure. If the Obama administration hasn’t done it, no American administration will. And then there’s Europe. Justice Minister Livni said that the discourse in Europe has become ideological. She knows what she’s talking about. She also said that a European boycott would not stop at products made in West Bank settlements. There’s no reason it should. The distinction between products from the occupation and Israeli products is an artificial creation. It’s not the settlers who are the primary culprits but rather those who cultivate their existence. All of Israel is immersed in the settlement enterprise, so all of Israel must take responsibility for it and pay the price for it. There is no one unaffected by the occupation, including those who fancy looking the other way and steering clear of it. We are all settlers. Economic boycott was proven effective in South Africa. When the apartheid regime’s business community approached the country’s leadership saying that the prevailing circumstances could not continue, the die was cast. The uprising, the stature of leaders like Nelson Mandela and Frederik de Klerk, the boycott of South African sports and the country’s diplomatic isolation also contributed of course to the fall of the odious regime. But the tone was set by the business community. And it can happen here too. Israel’s economy will not withstand a boycott. It is true that at the beginning it will enhance the sense of victimhood, isolationism and nationalism, but not in the long run. It could result in a major change in attitude. When the business community approaches the government, the government will listen and also perhaps act. When the damage is to every citizen’s pocketbook, more Israelis will ask themselves, maybe for the first time, what it’s all about and why it’s happening. It’s difficult and painful, almost impossibly so, for an Israeli who has lived his whole life here, who has not boycotted it, who has never considered emigrating and feels connected to this country with all his being, to call for such a boycott. I have never done so. I have understood what motivated the boycott and was able to provide justification for such motives. But I never preached for others to take such a step. However, with Israel getting itself into another round of deep stalemate, both diplomatic and ideological, the call for a boycott is required as the last refuge of a patriot.